Set this nifty worktable combo up wherever you need it for efficient, affordable use. This Berkeley Classic Mini Combo comes with a baked enamel, black base and a white work surface measuring 30” by 42". The included side storage tray provides convenient storage for pens, pencils and other needed materials. 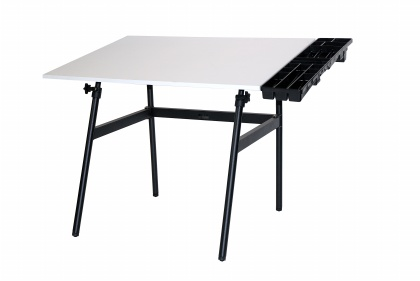 Manufactured by well-known Berkeley, this unit includes a work surface that sits above the popular folding table base. These combos are inexpensive enough to outfit an entire classroom or design studio. The unit folds up for convenient storage and is easily portable to job sites or temporary locations. The rugged construction provides years of reliable service and the work surface is easily cleaned. A work lamp is easily attached as desired. Shipped flat pack to save on costs, this item requires some assembly using basic tools. Oversize Shipping costs are $55.00.